1. 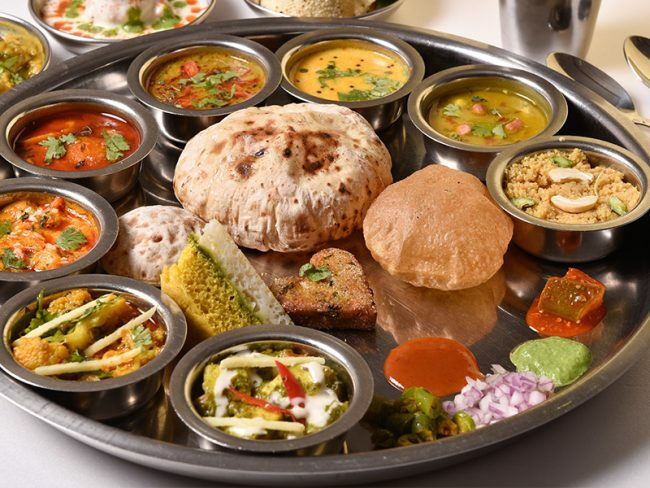 12 best Rajasthani dishes! With its breathtaking palaces and spectacular landscape, Rajasthan is truly a land that represents the rich cultural heritage of India. The flavourful diverse cuisine adds to the uniqueness of the state which is inimitable in various aspects. Today, we are going to talk about 12 most popular dishes of the ‘Land of Maharajas’ and what is so special about them. Shahi Gatte: Shahi Gatte, popularly known as Govind Gatte in the state of Rajasthan, this is the royal version of the authentic dish-Masala Gatte. Made with besan, this gravy dish has the richness of dry fruits and is best served with steamed Jeera Rice. Pyaaz Kachori: The perfect blend of finely chopped onions along with grounded spices makes this breakfast snack a must-try along with spicy aloo curry and sweet & sour tamarind chutney. Mohanthal: Popularly known as Mohanthal or Besan ki Barfi, this dessert dish of Rajasthan has a nice chewy texture and leaves a grainy flavour in the mouth. This dessert dish is an inseparable part of all celebrations and festivals. Mohan Maas: With its history associated with Maharajas of the state, this meat preparation is no less than a treat for the non-vegetarians. With the richness of fresh milk and grounded local spices, this main course dish is slow-cooked on ‘chulha’ which makes the meat tender and juicy. The aroma of khus-khus, lemon and cardamom add to the beauty of the dish that is best served with dry fruit paratha. Methi Bajra Poori: Made with minimum oil, bajra flour and methi leaves, this Rajasthani snack is quite popular amongst weight conscious people. This snack tastes heavenly with green chutney and boondi raita. Churma Ladoo: Served with Dal Bati on festivals and special occasions, Churma Ladddo is a dessert made with wheat flour, semolina, dry fruits, sugar and desi ghee. Laal Maas: When you talk about Rajasthani food, you just can’t ignore the crowd favourite, Laal Maas. The aroma of desi ghee and spiciness of red chillies make this mutton preparation a must-try that tastes divine with bajra roti and even plain rice. Ker Sangri: Made with berries and dried beans, this side dish with a tangy flavour is more like a pickle that goes well with Bajra Roti and even parathas. Rajasthani Kadi: If you are in Rajasthan, your Sunday lunch is incomplete without this version of Kadhi which is very pungent and spicy. For the perfect kick to your taste buds, have it with rice and feel the difference. Gatte ka Pulao: This variation of Masala Gatte reflects the love of the state for the dish. Also known as Ram Pulao, this main course preparation has a unique combination of steamed rice and spicy gate. For this, the gattas are first boiled and then sautéed with grounded spices and mixed with steamed rice. Dal Bati Churma: Make the best of Rajasthani cuisine with the most popular dish called-Dal Bati Churma. Though the smacking batis are traditionally made on firewood, the gas stove variation tastes equally good with Panchkuti Dal and churma. This appetizing combination is an all time favourite of the state. Aam ki Launji: This sweet and tangy instant pickle is made with raw mango chunks slow-cooked in sugar or jaggery syrup and has the goodness of fennel and nigella. You can serve it with parathas or even with piping hot pakoras.